We're absolutely delighted with the personalized details! 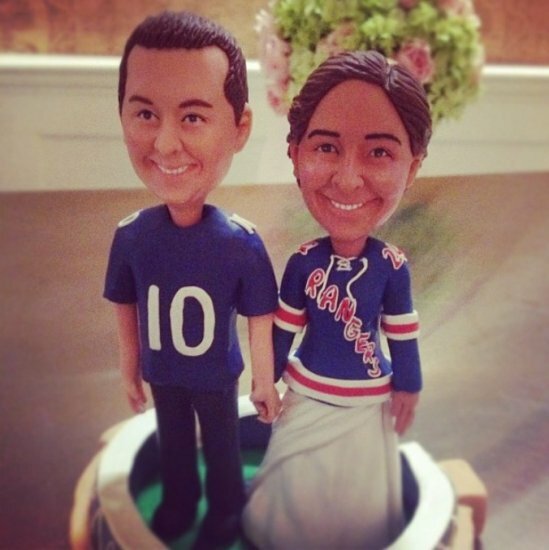 We surprised our son and daughter-in-law at a family celebration of their marriage with the cake topper. It's on their fireplace mantel where it still keeps them smiling. Thank you for the great product and outstanding customer service. 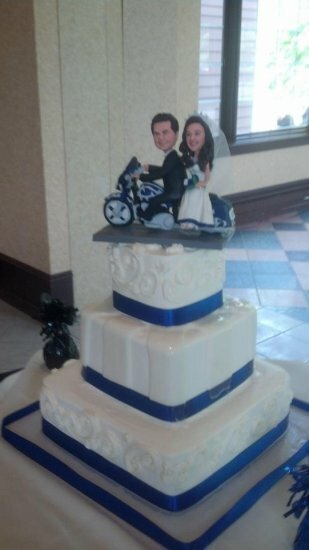 I was very happy with our cake topper, I think it got more attention at the wedding than we did. 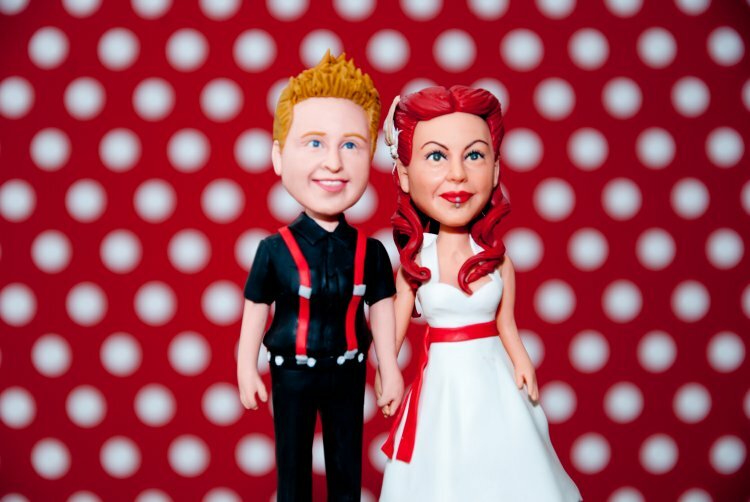 The figurines were amazing, they really did look like us, and my dress matched as close as it possibly could. My husband wanted to be in a Philly's outfit, and have a long name on the back, but they made it work. They kept us updated on the whole process, and where they were with pictures and information and the possibility to give us input. I would definitely recommend it to anybody that's looking for a unique topper, it may be expensive but it is well worth the money. 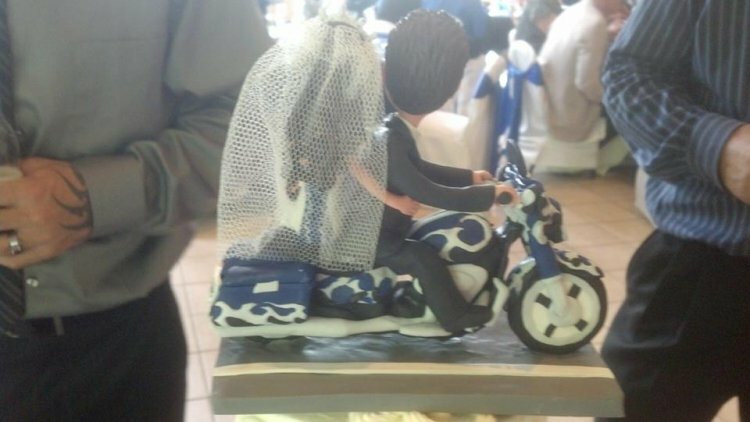 My fiancé and I were looking for a unique cake topper for our wedding. 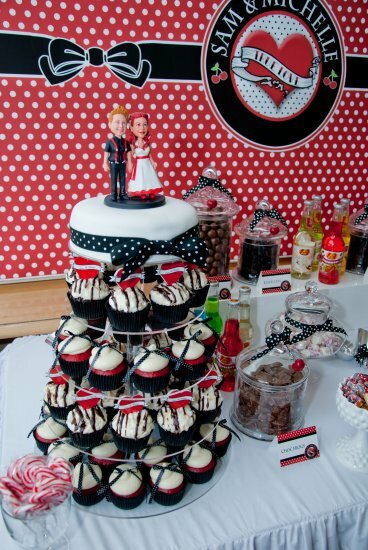 We had originally met playing volleyball and wanted to incorporate this into our wedding day. After looking online I ran across this site and thought it would be the perfect touch! 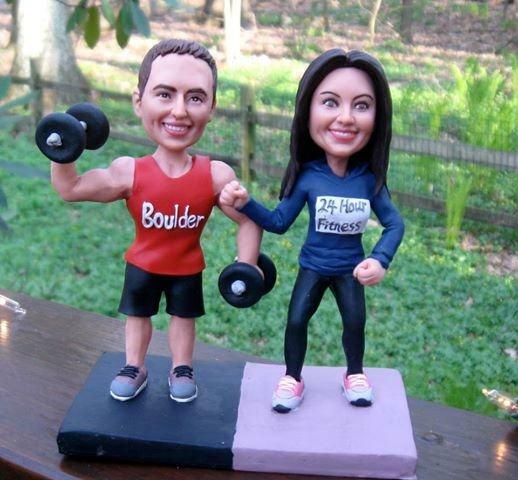 It was even more intricate than I thought having our figurines actually molded to our actual photos. The company really paid attention to detail especially in the creation of our topper and there was various drawings and discussion back and forth as our topper was created. This showed their commitment to really wanting the end product to be exactly what we had envisioned. 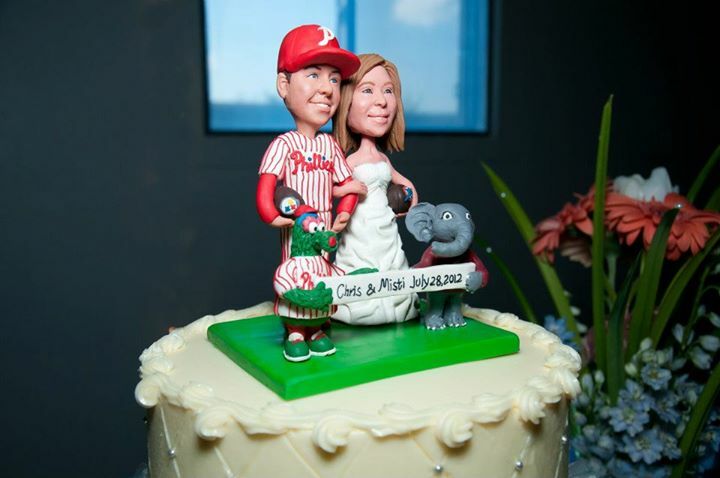 I would definitely recommend this to anyone looking for a creative cake topper. We now will have this memento to remember our special day forever. With all the work involved by the company and the detail and care involved this topper was more than worth the money! Give it a try, you wont be disappointed! When I first saw this site--i was overjoyed. 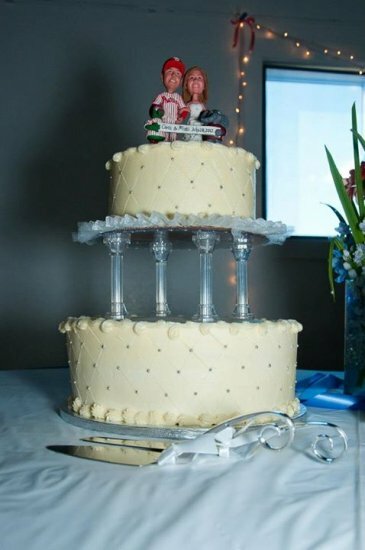 I immediately sent the info to my daughter who loved the idea of a personalized cake topper. We did not tell her future husband--really no one knew we were doing this. On the day of the wedding the look of joy and utter shock when the groom looked at it and realized it was him in his fire fighting gear. He was thrilled. The details were right on and amazing. The dress was replicated beautifully, right down to the beading on her dress and the rouging was detailed beautifully. 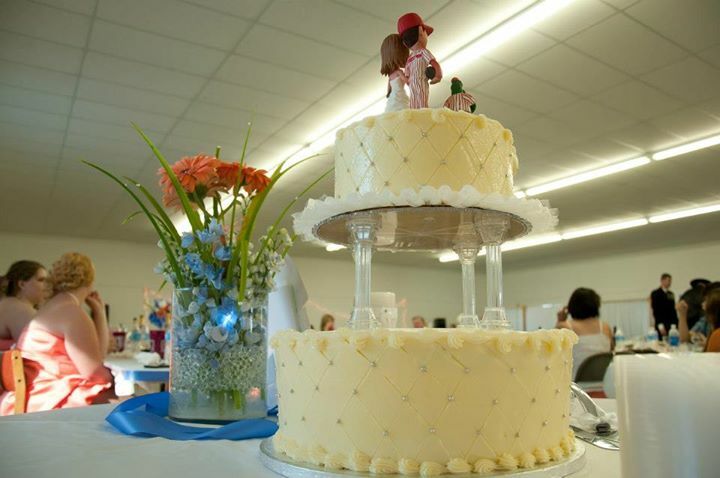 We also received a lot of compliments on it--most of the wedding guest were his fellow fire fighters. Many thanks to Wade and his team for making this special day even more special. Many of my daughter's friends saw it on facebook and loved it--so we linked the site to the picture so others can experience the happiness and joy we had making it and then finally getting the finished product. Once again a big thank you. 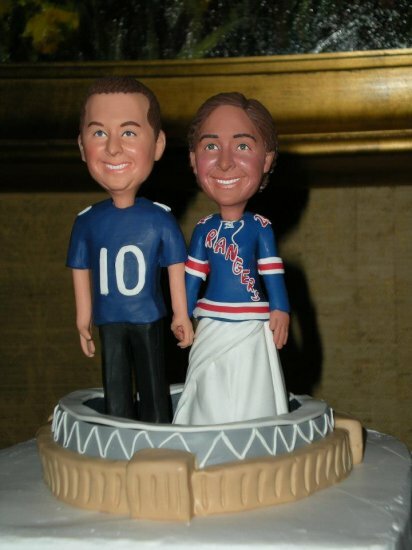 My fiancé and I are very pleased with the cake topper that was done of us. I was in constant contact with Wade, who was extremely helpful. Upon completion, it arrived quicker than expected and was wrapped very nicely to avoid breakage. Would order again! 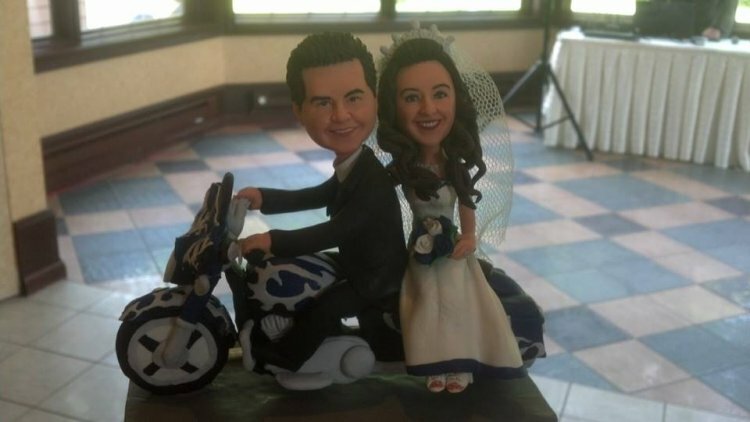 We loved our cake topper form FunDeliver.com! 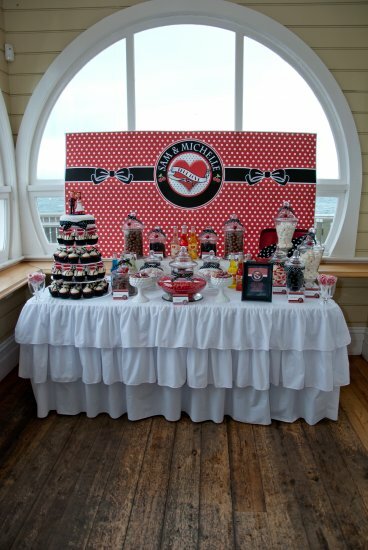 It was exactly what we were looking for and added an unique touch to a wedding that was mostly beach themed. 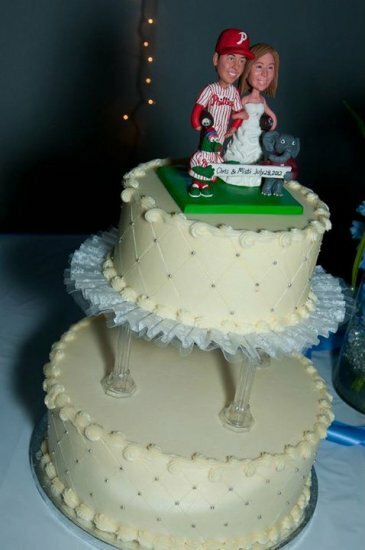 Everyone thought we were going to have a sports themed wedding. 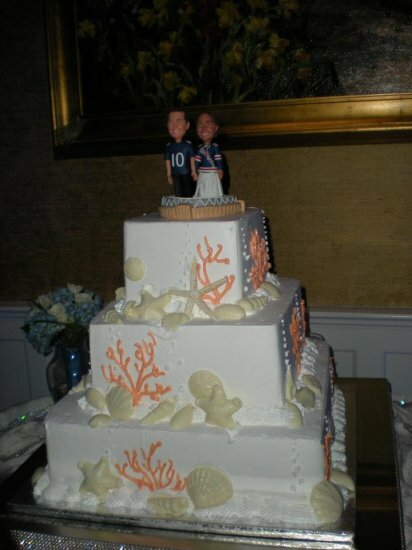 We didn't go with the sports theme but wanted to add something that was "us". Everyone loved it! Wade was great in keeping us updated with progress and when things needed a slight change, Wade and his team did a great job in meeting our requests. 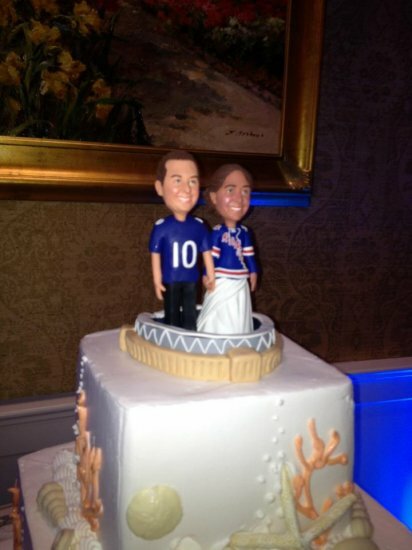 They did an all around wonderful job with everything that went into the process of making the topper! 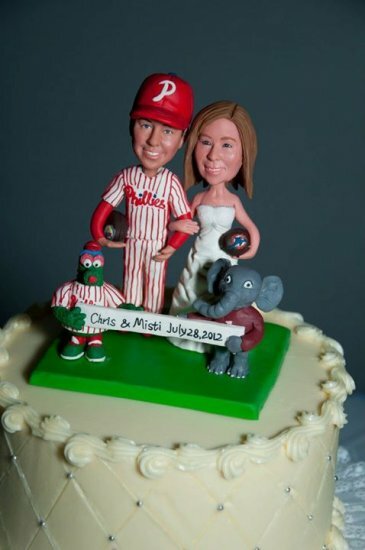 I highly suggest FunDeliver.com to anyone who is looking to have some fun with their cake topper. We've been married almost a year and it's one of the things that people talk about all the time. Don't wait on it either - takes a little time to ship. 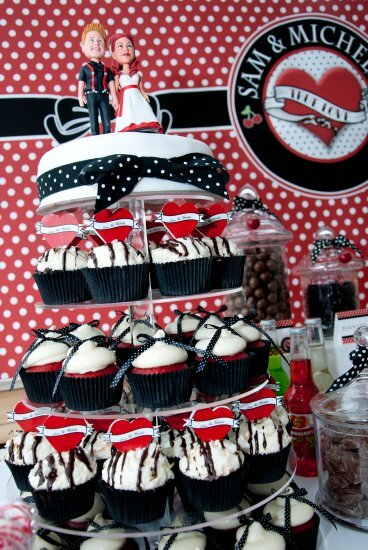 It's defiantly worth the wait for something fun for your special day! This was the talk of the wedding, everyone could not believe how much it really looked liked us and the colors and details were just perfect. It now sits on our entertainment center as the center piece. I came across this site by accident, but fell in love with it immediately. 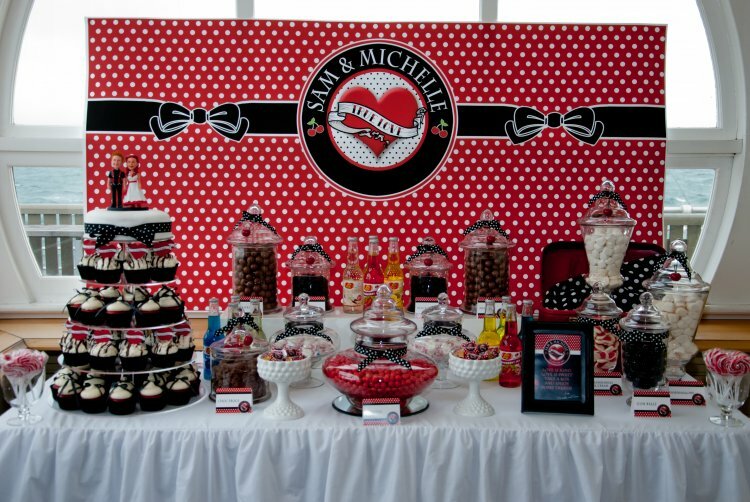 My designer worked with me the whole way thru the process and did a fantastic job. I couldn't of asked for anything better. I gave this to my sister and her fiance and it was a great hit. Everyone screamed because then likeness was incredible. In would definitely recommend Fun deliver to everyone. 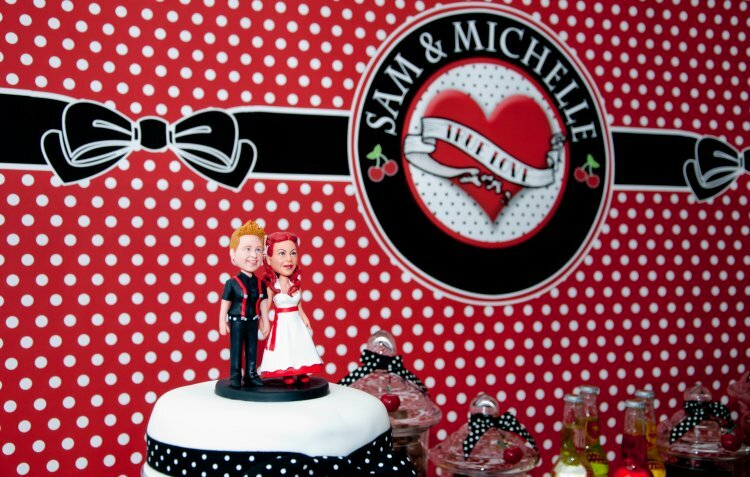 We are so happy with our cake toppers they are fantastic!!! They were the talk of the wedding and people still rave about them now!!! We cannot believe that from a few photos this great product was made. We were involved every step of the way and felt connected throughout the whole process. Thank you for such a great momento for our wedding that we can keep forever. We would recommend this product to anybody!!!! Product was just what I wanted. Communication was great and changes were made quickly. Product arrived quickly and was packaged extremely well. Thank you guys so much.